The internet is on the case! 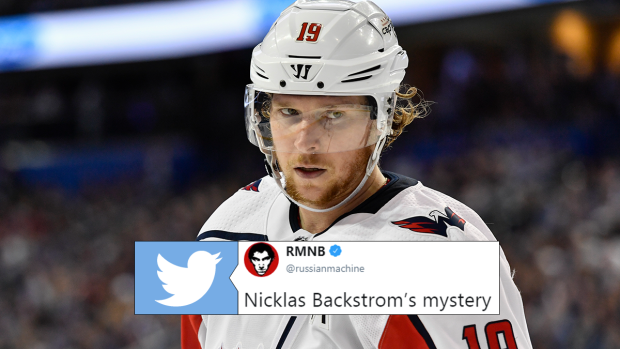 Nicklas Backstrom missed four straight games at the end of the Pittsburgh Penguins series and the beginning of the Tampa Bay Lightning series and some crafty hockey fans may have found out why. As per usual in the NHL, the injury that Backstrom was playing through was never revealed and fans were initially told it was an upper-body injury, then some information seemed to get out that it was in the hand/wrist area. Now, with the internet on the case, two more clues appear to have fully revealed what’s wrong. First, there was the handshake at the end of the Tampa Bay series, where he was purposely avoiding shaking with his right hand, even if it meant awkwardly crossing his body for a backwards shake (One fan already noticed that Backstrom’s hand was injured earlier this month, but this confirms it’s still bothering him). Next, was his post-game interview. Most of the time you can’t see the players hands, but Backstrom reached his hand up to scratch his nose at one point and his finger looks massive. That’s a very swollen finger. We’re not going to try to diagnose what that means, because it could be anything. On top of that, we know that players are willing to play through basically anything. We’ve had several severe injuries revealed as teams have been eliminated in the playoffs and Chara even played through a broken finger in the Leafs/Lightning series. The Golden Knights and Capitals have the full weekend off before they start the Stanley Cup Final, so we’re pretty sure we’ll be seeing Backstrom back on the ice with whatever injury he has.